Easy German Apple Cake, also known as Apfelkuchen in German, prepared with raw harvest time apples. This is a traditional recipe is authentic and from my region Tyrol Austria and Bavaria Germany. What is the German Apple Cake? To prepare the German apple cake, a dough is mixed together and the apples are cut and placed on top of the cake before being baked. This is the fundamental difference to say a French apple cake. The German Apple Cake, as the name indicates comes from the central European region. To be more precise the apple cake, aka Apfelkuchen is a Bavarian German dessert AND an Austrian cake. Bavaria and the touching Austrian regions have everything in common. The name German apple cake for this dessert is a bit misleading in that sense (as it goes with many dishes from that region such as the Red Cabbage side dish) because both countries call these dishes their own. This is because Austria speaks German but it’s not Germany (I had to point this out not to appear as a traitor to my country). Apples are the main harvest in September and October besides other local tree fruits such as pears and plums. In those two months, you end up eating more apple desserts than ever! We grow a lot of different apple tree variations, it’s hard to put a number on paper. Most farmers have an apple tree, most people have a house and a garden with apple trees growing. Apple trees are to Bavaria and the alpine regions in Austria and Switzerland, what maple trees are to Canadians! The list of apple varieties in English is super small compared to the extensive list of apples in German which includes the regional German dialect names as well. This alone is an indication that we have a huge cultivar of apple varieties in central Europe. In fact, the garden association promotes grafting of lesser known, almost extinct varieties of apples. My dad grafted over 5 apple varieties on one young tree, that way we get to taste different apples! Therefore, you have to understand, the choice of apples for this German apple cake is of minor importance. People use what’s in the garden. People rarely go to buy apples in villages because they can get apples from their local farmer or the neighbors gave them apples. I personally I love my apple cake with a sour apple variety because I don’t like my cake overly sweet. Which apple you pick is up to you and you get to control your cakes outcome that way! 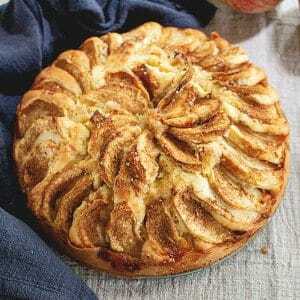 How to make the German Apple Cake? To prepare a traditional apple cake, you will need only a few basic ingredients. This includes all-purpose flour, sugar, eggs, butter, baking powder, a pinch salt, apples, and cinnamon. The dough is mixed together, the apples are cut into slices and then placed over the dough in the mold. Simple and easy. 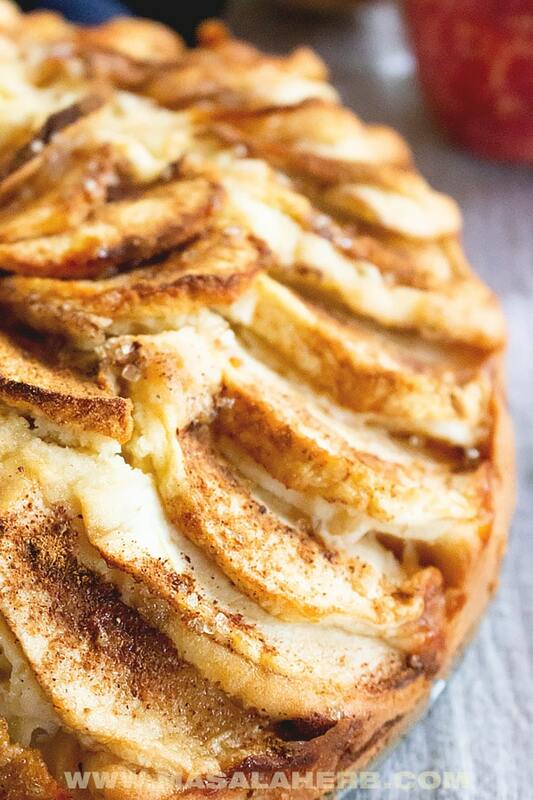 Some people like to add lemon zest to the dough, I skipped that because I like my cake with a cinnamon apple touch. I would add lemon zest if I don’t add cinnamon over the cake. 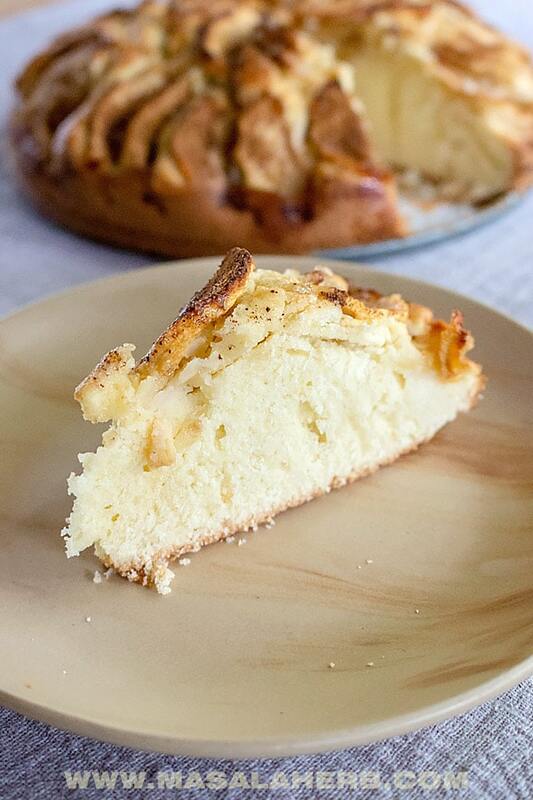 How and when to serve the German apple cake? These days apples are common all year round, however, this traditional cake is still considered a fall dessert. 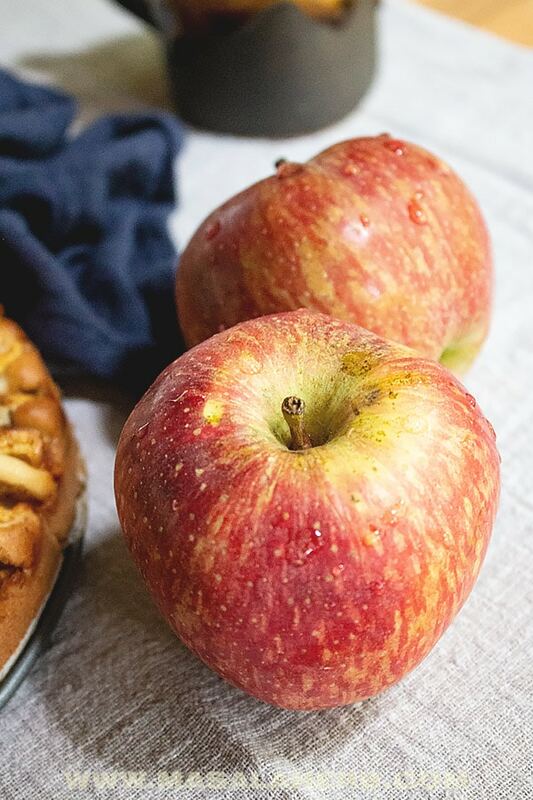 Therefore, you will see this German apple cake being served around our Thanksgiving period in October, also during festivals such as the Oktoberfest or the Rosenheim Herbstfest (which by the way is way more fun than the overhyped Oktoberfest). In Bavarian homes, and Austrian homes across the border, you will most probably be invited to a slice of this apple cake. It’s served during the coffee time (around 3 pm) with whipped cream. Some people go all the way and serve up a cold sausage and cheese platter as well. I like to use a hand mixer to blend the ingredients together but a kitchen machine works great too! 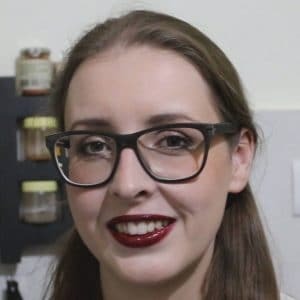 A simple silicon spatula is your best friend to mix for various reasons as you can see in the video. For the cake mold, I use an 8-inch springform because I can take out the cake easily once baked without breaking anything. Easy German apple cake, great for beginners and if you need a cake instantly. Deliciously moist and with raw apples. You need to bake this German dessert asap! Everyone loves apple cake. Place the soft butter into a mixing bowl with the sugar. Mix and whisk the butter-sugar into a creamy consistency. Add the Eggs to the mix and blend smooth. Now add in the Salt and baking powder. Besides that throw in some of the flour. Start to blend the mixture and continue to add in the flour, step by step, until you have used up everything. Mix the whole content to a smooth batter. Peel your apples, cut into slices. Heat up your oven to 180 Celsius/ 350 Fahrenheit. Prepare a springform with a layer of baking paper at the bottom. Pour the batter into the mold and spread evenly. Arrange your apple slices on top. Sprinkle the cinnamon and brown sugar over the apple slices. Bake the cake for about 38 minutes or until the cake is golden on the outside and baked on the inside. Test if it’s done by going into the cake with a knife. If the knife comes back clean, it’s baked through. Use sour apples if you want a cake that is less sweet. You may leave the apple skin on the apples and just cut them into slices. One serving size equals 1 cake slice. The nutritional details are according to one serving. 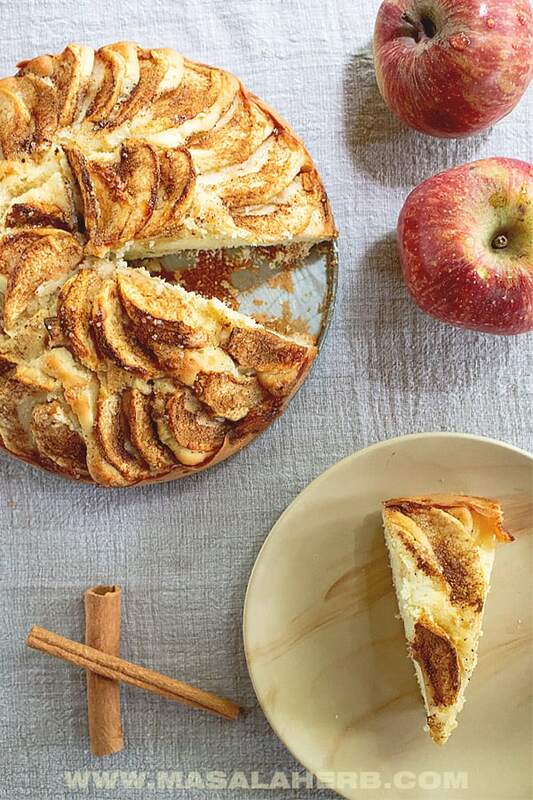 Dear reader, when are you planning to bake this German apple cake? Please feel free to share your thoughts and ideas with us in the comment section further below! 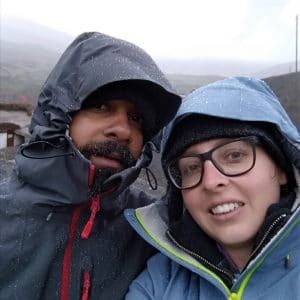 Get the best MasalaHerb.com Recipes + Travel inspirations and special offers for FREE! I agree to receive food and travel related news, products and special offers Opt-in. This post may contain affiliate links, and I receive a small commission when you click through and purchase. It basically buys me my daily coffee and cheese, and yes, my flour so that I can make pizza for dinner! I grew up eating German apple cake because my mom is German. Brings back memories! 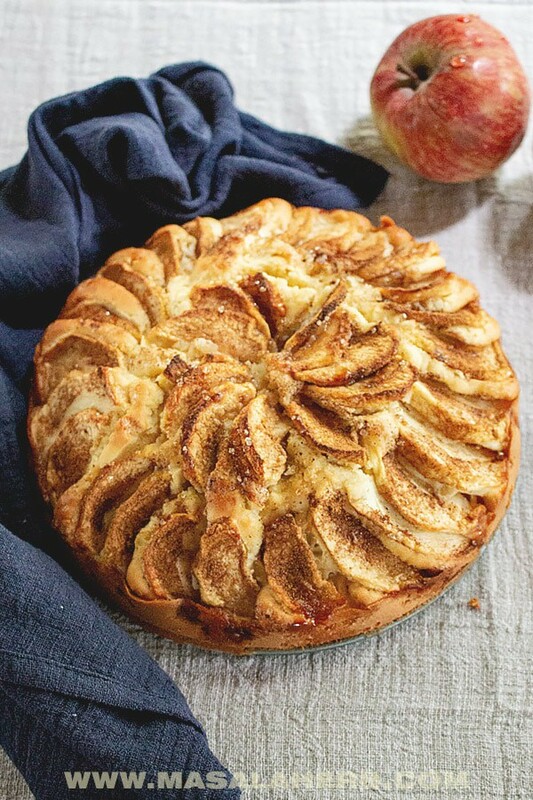 I’m so excited for apple season and to make this beautiful German Apple Cake! I follow the recipe and the cake was hard I think the ingredients are wrong, 7 ounces and 2 cups is not the same. Hi Alejandra, thank you for your comment. I measure in cups, ounces, and grams, when I cook and all my recipes have been tested countless times before. You can see it in the video how this cake was made and how it turned out. The only thing that comes to my mind why your cake turned out hard, is the baking time. Not all ovens are the same and voltage at times can play a difference as well. That’s why it’s good to bake until you see your cake golden brown and test if the cake is finished baked by poking it with a knife. If it comes out clean, the cake is done. Also, these kinds of regional German/Austrian cakes tend to be rather on the dry side (like a Gugelhupf cake). If you prefer super moist cake, check out the french apple cake. The major difference to the German apple cake, is that in the french apple cake the apples pieces are mixed into the batter, resulting is a wet cake. Made this today and it looked just like your picture! I followed the recipe to the tee! It’s really more like an over baked biscuit not cake like at all! So disappointed but I might be able to salvage it by making it into a trifle with lots of pudding! Hi Gail, thanks for your comment. I calculated around to see why the sodium content is up. Basically, the butter is the cause of this. If you use light butter, it reduces the sodium by 800 mg.
I’m confused on the nutritional information. This cake cannot be 2719 calories per piece. In fact, the other items listed seem all incorrect too. Especially since this is a basic cake without all the sugar and heavy sweet syrups Americans put on their desserts. Could you please check your nutritional values again and let me know at lkoschock@outlook.com thank you so much. I think it sounds very good and I’d like to try it but not at those high calories. Lorraine, thank you for letting me know. It was a glitch, I fixed it. The nutrition info is showing per cake slice now. Hi, this may be interesting you: Easy German Apple Cake Recipe - Apfelkuchen!